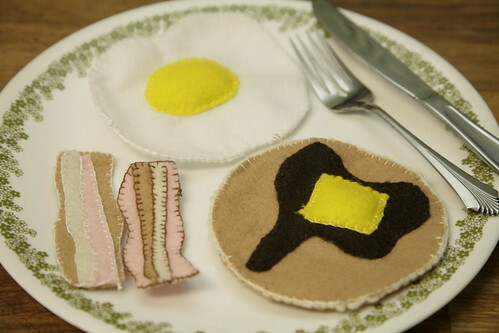 Inder Loves Folk Art: Felt breakfast. As you can see, I am still in felt-land. All I can say is, felt is super addictive! The possibilities are endless, and the internet awesomeness is similarly endless. And I'm happy to report that my blanket stitch skills are rapidly improving. But I haven't completely forgotten my sewing machine, either. (Also, I got something special for Christmas that I can't wait to share with you!) I am about to go to go make some new pants for the Magster. Stay tuned! Love it! Must say you missed the opportunity for a heap of 'felt like breakfast' kind of puns though. Oh yes, the snaps will get boring shortly, I'm sure! ;-) When I gave Helen this gift she tossed it to the side in total disinterest. Ah well. What can you do?